Library and Archives Canada (LAC) holds records related to the French colonial period in early Canada, and some of these records are available online. Included are records about the French cod fishery in the Atlantic region and the French colony of Plaisance in Newfoundland (1662–1713). 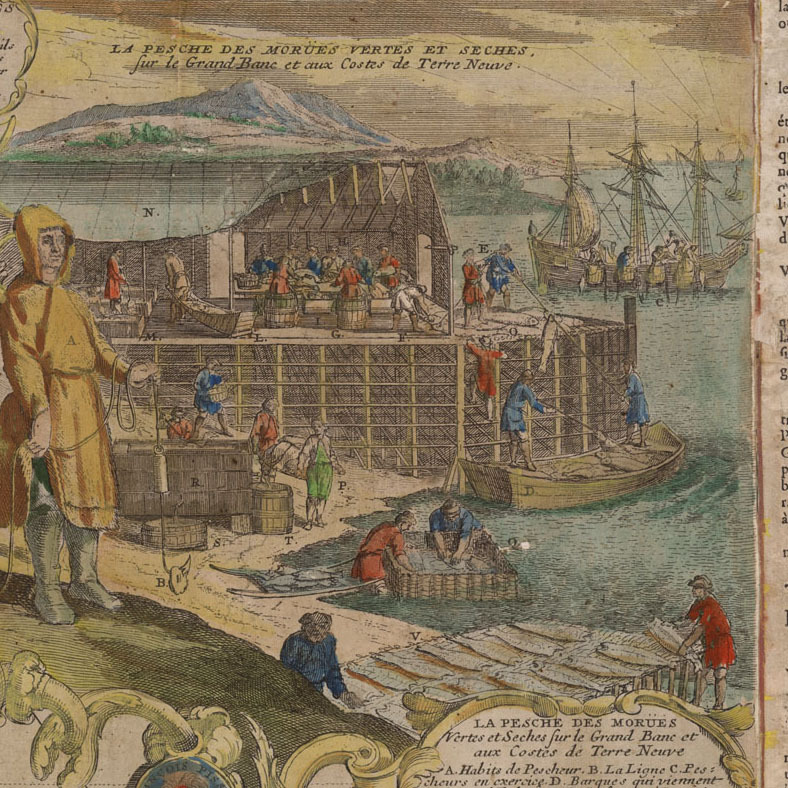 During the 17th century, the cod fishery in Newfoundland became increasingly important to the European fishing industry. France was one of several European countries competing for a share of this fishery, and in 1662, the French established a garrison town at Plaisance, on the western side of Newfoundland’s Avalon Peninsula. The French wanted to secure their merchant fishing fleet’s access to the fishery and their share of the European market for cod. The site of Plaisance was chosen for its proximity to rich fishing grounds, its sheltered and relatively ice-free harbour, and its strategic location. Eventually, the colony of Plaisance grew to have a small permanent population, with military fortifications, and served as a base for the French Atlantic cod fishery. A view of a stage and also of the manner of fishing for, curing and drying cod at New Found Land […] (c003686) A digitized copy of the map L’Amerique, divisee selon l’etendue de ses Principales Parties, et dont les Points Principaux sont placez sur les Observations de Messieurs de L’Academie Royale des Sciences. Dressee Par N. de Fer, Geographe de Monseigneur le Dauphin can be seen at the Osher Map Library website. The French and English established colonies along the southeastern coast of Newfoundland, which encroached on the Indigenous territory of the Beothuk and the Mi’kmaq. The French had little recorded interaction with the Beothuk, who withdrew from the coast and its resources to avoid contact with the European fishermen and colonists. Before the arrival of the colonies the Mi’kmaq navigated the waters between Cape Breton and Newfoundland by canoe. They established friendly relations with the French, becoming important trading partners and military allies. The colony of Plaisance encountered many difficulties, particularly during its first few decades. Its population was small and poorly supplied, and its early governors were ineffective. However, in the 1690s, the colony became stronger, and the French administration highly valued the Atlantic fishery. The economy of Plaisance was largely based on the cod fishery. The colony’s small permanent population with its “habitants-pêcheurs” was bolstered each year with the arrival of a large seasonal workforce on the merchant fleet from French ports. All worked intensely to catch and preserve cod during the summer months. The residents of Plaisance relied on the merchant fleet to bring extra labourers, food and manufactured goods, and to ship their dried catch back to Europe to be sold. During this period, there was ongoing conflict between the French and the English, as well as between the Mi’kmaq and the English. In the 1690s and early 1700s, both the French and the Mi’kmaq conducted raids, sometimes jointly, on English settlements on the Avalon Peninsula. The War of the Spanish Succession culminated in the Treaty of Utrecht, signed in 1713, in which France ceded its claim to Newfoundland to England. The English took over the settlement of Plaisance, changing its name to Placentia. Most of the French colonists moved south to the colony of Ile Royale (now Cape Breton). There they established themselves in the new French settlement of Louisbourg and continued their work in the French cod fishery. The French also retained the right to fish off the coasts of Newfoundland and to process their catch along stretches of the shoreline, known as the French Shore. LAC holds records related to the colony of Plaisance, among other topics, in the Fonds des Colonies (MG1). This fonds includes copies and transcriptions of selected records related to the French colonial period in early Canada. The records are in French, and the original documents are held at the Archives nationales d’outre-mer in Aix-en-Provence, France. The Fonds des Colonies consists of records including correspondence, reports, journals, instructions, records of fortifications and commerce, civil registers, and notary documents. Many records in the Fonds des Colonies have been digitized and are available directly on the LAC website. Use LAC’s Collection Search to search for records about the colony of Plaisance. Try keyword searches, such as “MG1 Plaisance” or “MG1 pêche” (without quotation marks), and use the drop-down menu to search “Archives.” Including “MG1” will limit your search results to records in the Fonds des Colonies; you can search more broadly by not including it. Because the original records are in French, try using French keywords such as “pêche” (fishing), “Terre-Neuve” (Newfoundland), or “morue” (cod). Valerie Casbourn is an archivist based in Halifax with Regional Services at Library and Archives Canada. 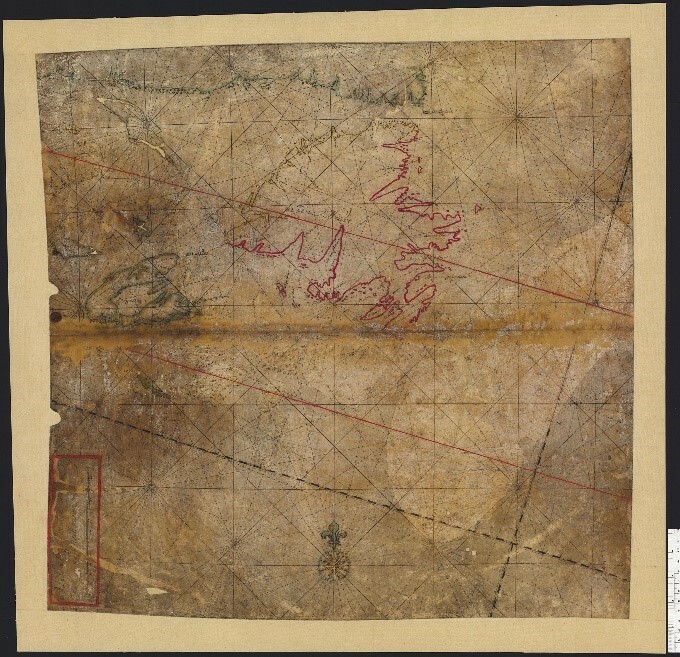 This entry was posted in Archived, Census, Exploration and settlement, Indigenous Resources, Maps and Plans, Our Collection and Facilities and tagged Beothuk, cod, fishing, Maps, Mi’kmaq, Newfoundland by Library and Archives Canada Blog. Bookmark the permalink.